We've named this line "Terra Cotta Intricata" with ceramic artist Ken Standhardt - the son of casket makers - bringing a wonderful new twist to the world of urns. His intricate designs cover the sides, bottoms and even the insides of the lids with precision, style and sometimes whimsy. Designed to impersonate basketry, the number of indentations in a piece - from 500 to 5,000 - generate a complex pattern made with just two simple and remarkable tools: a can opener and a pencil! 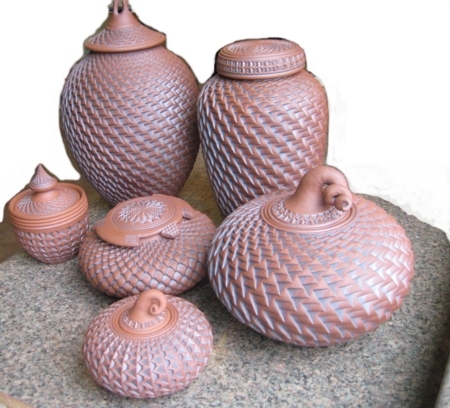 The urns are available in a variety of shapes, colors, and styles. Standhardt's works in the gallery on the left are marked AVAILABLE FOR PURCHASE or AVAILABLE FOR COMMISSION. Click on each image for a larger view, to see dimensions and price, and to read details about the piece. Please note the piece's name, price and size, and contact us by e-mail or call us at 503-493-9258 to discuss an order. Our current stock can ship almost immediately - let us know ASAP if you need an expedited delivery. Ken can create a customized urn based on the designs you see here. Most urns can be done in any of the clay treatments or glazes he uses, and many of the lid and vessel designs of the urns can be interchanged when he customizes one for you. Customized pieces may take as much as 3-6 months to create, depending upon backlog. Generally, prices for custom urns can range from $400 to more than $3,000, depending on the size of the piece and the time involved in its design and creation. Bronzes of any design are also available. Click the button below to add the Terra Cotta Intricata to your wish list.